I've been reading a lot of Christmas-y blogs lately and I'm loving them. I haven't been able to get any posts of the Christmas season up yet so I wanted to make this one a Christmas post. It hasn't felt a lot like Christmas to me yet this season. We live in Utah, where normally, we have snow from October to April. But this year we haven't had much snow yet. I think it snowed once in November. And for me to be sad about that is huge because I hate winter and cold. But I'm ready for the snow to help me feel Christmas. We've already got to do a few of these this year. Like the Christmas Devotional, if you haven't ever seen or read it, you really should. It's a great reminder of what Christmas is really about for all faiths. We decorated the day after Thanksgiving. That's always been when we decorate for Christmas. 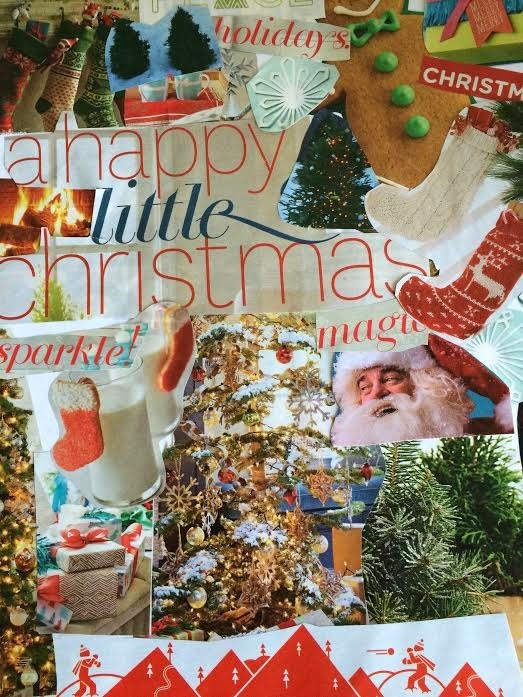 J and I made a Christmas collage one day. I think it turned out fantastic, it's a great addition to our Christmas decorations. As for serving others, I'm going to challenge all of you and myself to serve one person every day at lest until Christmas. This really helps the Christmas spirit for everyone. It can be anything from doing a secret santa to sending someone an uplifting text message to brighten their day. I will do my best to add the act of service I did to every post until Christmas. Do you have any fun traditions that help you feel more in the Christmas spirit? Comment below! And if you want to join in on the service, feel free to add a comment of what you did if you feel inclined to do so. Thanks Kristin. Sadly enough I think Grant Weymen said it will be like this for at least 10 more days. I think we need to start praying for snow on Christmas morning.